Seamus Coleman, Cyrus Christie and Marc Wilson are doubts for the visit of Germany this week, while several others are definitely missing. Defender Cyrus Christie didn't take part this morning. IRELAND MANAGER MARTIN O’Neill must wait on the fitness of a number of players ahead of this weekend’s Euro 2016 qualifying double-header. World champions Germany visit Dublin to play in the penultimate Group D game on Thursday, before the Boys in Green head off to Warsaw to face Poland on Sunday evening. Currently occupying the third place, Ireland’s most realistic chance of qualification looks to be via the play-offs, which they will do provided they match Scotland’s result against the Poles. However, already without Glenn Whelan and James McClean through suspension as well as injured pair Stephen Quinn and Harry Arter, O’Neill has some worries across his backline for the clash with Germany. Aston Villa defender Ciaran Clark is definitely ruled out with a quad problem, while fellow centre-half Marc Wilson has remained at Stoke City for treatment on a calf injury, which will be assessed later in the week. “Marc played a couple of games in quick succession,” said O’Neill. “He had to pull out of a training session last Thursday and he has had to have some work. First choice right full-back Seamus Coleman didn’t make the Everton squad for yesterday’s Merseyside derby at Anfield meaning he has now been absent for the Toffees’ last four matches. 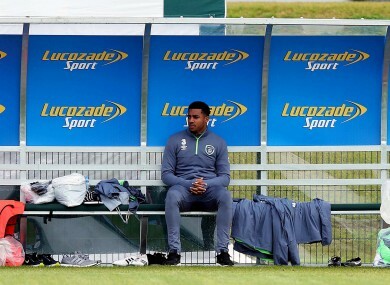 The 26-year-old was present at Ireland’s training camp in Abbottstown this morning but didn’t take part in the session. If Coleman doesn’t recover in time, Derby County’s Cyrus Christie would his natural replacement. However, he also sat out today. Cyrus didn’t train today as he is having a little problem with his groin but hopefully he will be available for selection,” added O’Neill. “He thinks he should be alright but we will see how he goes. Captain Robbie Keane and fellow striker Kevin Doyle, who both scored in the MLS last night, have yet to link up with the squad. What can Ireland learn from Germany’s footballing reinvention? Email “Headache for O'Neill as injuries stacking up on a massive week for Ireland”. Feedback on “Headache for O'Neill as injuries stacking up on a massive week for Ireland”.